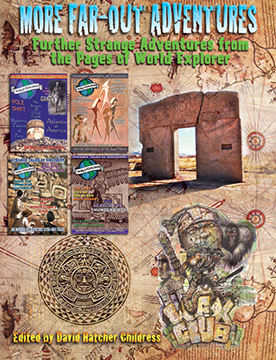 An all-new collection of stories from the pages of World Explorer magazine, one of the great magazines of retro-weirdness, travel, archeology, cryptozoology, adventure and humor—a magazine that would fascinate Indiana Jones and have him rolling with laughter. In a large-format paperback, this anthology includes articles from Volume 2 and Volume 3, plus special features like Professor Wexler, WEX Remembers and cool adverts. Authors include: David Hatcher Childress, Mark Amaru Pinkham, Dr. Marc Miller, Albert E. Sindlinger, Patrick Geryl, Jennifer Bolm and others. Articles in this book cover such subjects as The Mystery of the Olmecs, Chupacabras, Thunderbirds, UFOs Over my Balloon, Tunnels in Guatemala, Crystal Skulls, The Enigma of Coral Castle, Churchward’s Lost Continent of Mu, Cargo Cults, Mystery of the Crystal Towers, Giants, and plenty more. Color and black and white illustrations in this large-format, deluxe book. This book is autographed by David Hatcher Childress on the title page. MORE FAR-OUT ADVENTURES: AUTOGRAPHED EDITION. Further Strange Adventures from the Pages of World Explorer Magazine Edited by David Hatcher Childress. 256 pages. 8x11 Paperback. Illustrated.